Welcome to HoistNow, your source for information on all manner of lifts, hoists, cranes, and other tools for picking stuff up. Whether you need to lift an engine, a beam, or a wheelchair – we have you covered. HoistNow offers general information on how different types of hoists, cranes, and lifts operate, so that you understand the mechanics behind these amazing tools. And we provide detailed lift reviews and comparisons, so that you can make an informed decision when you decide to purchase one. Chain hoists are great tools that can be utilized to lift most any kind of heavy payload. They are frequently used in garages, machine shops, and other industrial settings. Just by pulling on a chain with minimal force you can use a chain hoist to easily raise loads that are far beyond your capacity to lift. While manual chain hoists are probably most common, there are also many electrical and pneumatic (air) driven varieties as well. The electric hoist and air chain hoists make lifting a heavy object even simpler – just as easy as pushing a button on a controller. 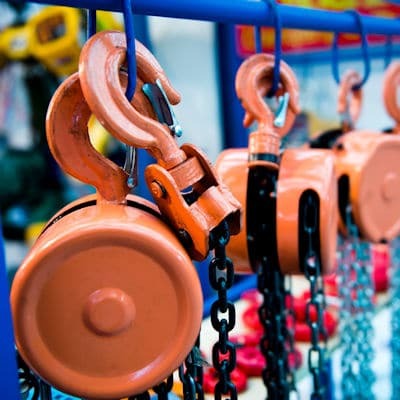 But even though manual chain hoists require require a little more effort from the operator to pull a chain (or pull a lever, in the case of lever chain hoists), the mechanical advantage offered by the hoist still makes lifting heavy objects a breeze. And the use of hoists is not limited to the job site – there are an amazing variety of hoists in use in situations not related to work. As a residential example, garage door openers, Jeep hardtop hoists, and canoe hoist systems are all tools used in the home. Mechanics often use engine hoists to lift motors out of vehicles. Even hunters can take advantage of this versatile tool, by using a trailer hitch deer hoist to help manage heavy game. A crane is used to lift a load using some kind of hoist attached to a beam. There are three main types of cranes – gantry cranes, jib cranes, and davit cranes. A gantry crane typically has a single beam supported between two leg structures to support the weight. A hoist is attached to the beam for raising and lowering a load. While large gantry cranes may be fixed to operate in a particular location like a loading dock, there are also smaller portable telescoping gantry cranes that can be moved from one job location to another. A jib crane is similar to a gantry crane, except the beam is attached to a single fixed post or wall mount (see our jib crane review page for examples). The beam has an horizontal orientation, parallel to the floor. It may rotate through an arc to allow movement of the attached load, but a jib crane doesn’t give you the same portability as you get from a gantry crane. A davit crane is similar to a jib crane in that it is attached to a single fixed post or wall. 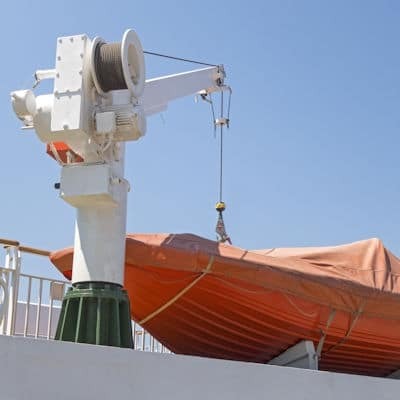 But it differs in that a davit has an angled beam, and usually features a hand or electric hoist or winch that extends from the tip of the beam. Davits can have fixed or adjustable booms, allowing you to move a load from one location to another within the crane’s range. There are three basic categories of lifts – auto lifts, personnel lifts, or material handling lifts. 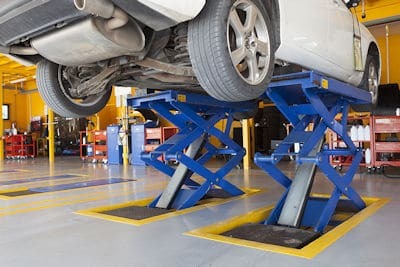 Auto lifts (also called car lifts) are used to raise and lower cars, trucks, and motorcycles, and are frequently used by both professional and home mechanics for working on vehicles. Sometimes they are even used for working on lawn mowers (see our review of lawn mower repair lifts). There are a variety of different types of auto lifts, including single post, two-post lifts, four-post lifts, car ramps, and scissor lifts. Personnel lifts are used to move people between levels in a building, or to raise them up or down from a vehicle. Elevators and wheelchair lifts help people who cannot navigate stairs travel from one floor to another. Electric lift chairs can help the elderly and infirm get back to their feet. And sling lifts are often used to lift patients into and out of beds, chairs, and baths. Portable lifts on wheels are useful for temporary lifting applications, while beam and track mounted sling lifts can be installed for more permanent solutions in a fixed location or standard route. They even make trailer tailgate assist lifts that can help you raise and lower the gate on your trailer. Material handling lifts are typically utilized to raise and maneuver large or weighty objects in manufacturing environments, offices, storage facilities, and building job sites. There are a number of different varieties of material lifts, including scissor and boom lifts, fixed and rolling platform lifts, and vertical mast material handling lifts like this collection of drywall lifts. A sump pump could also be considered a material lift, because it lifts the water out of a basement. Winches are a type of hoist that typically pull loads along the horizontal plane. A winch utilizes a cable, rope, strap, or chain that winds around a horizontal rotating drum. The drum is turned by a manual crank or by an electric motor to pull load in the desired direction. 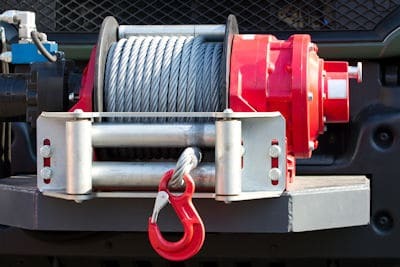 There are a number of different types of winches available, including trailer winches, electric winches, and portable cable pullers. Trailer winches are one popular category of winch. These devices are typically manual crank winches that are mounted to the tongue end of a trailer. They often use a steel cable with attached metal hook, and are most common on boat trailers. They make pulling a boat out of the water and up onto a trailer a snap. You can read our reviews of the top 12-volt electric boat trailer winches here. Boaters also frequently utilize winches to raise and lower an anchor to fix their boat in position. These specialized devices are much lower in strength than the units that pull a boat onto a trailer, but they still save a lot of time and effort once you are out on the water. We recently reviewed the top 12-volt electric boat anchor winches here. Cable puller winches – also known as come along winches – are another popular tool. These portable devices typically have a fixed mounting hook at one end, a manual ratcheting crank with a long lever, and a steel cable with an attached hook that extends out of the other end. Cable puller winches are great for dragging items that are too heavy to push or pull by hand. Electric winches are another very popular class of winch, especially among the off-roading community. Many Jeeps and other 4×4 vehicles use bumper mounted electric winches to help pull out their vehicles when they get stuck in the mud. Since these winches are powered by the vehicle’s engine, getting out of a mud hole is as simple as extending the steel cable, wrapping it around a tree, and pushing a button. Read our review of the best electric winches for the money. If you already have a winch but are looking for better cable, check out our list of the best synthetic winch rope. Other electric winch models have more commercial uses, such as moving farm equipment and dragging vehicles up onto tow truck beds. A jack is a portable lifting device used to vertically raise a heavy object. 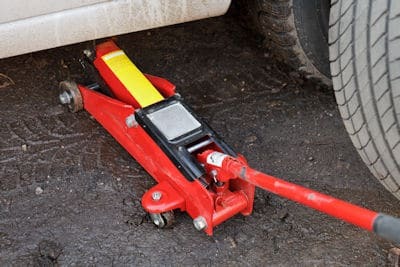 Most people are at least passingly familiar with a jack, because almost every automobile sold comes with one variety of jack or another to facilitate changing a tire. But jacks are also used to raise more than just cars – they are also useful for lifting motor homes, farm equipment, and even buildings for construction or remodeling. Within the category of jacks there are a number of varieties that employ different lifting mechanisms. A screwjack is an inexpensive type of jack that is frequently included with automobiles. The operator turns a threaded rod that extends the jack and lifts the vehicle. Bottle jacks are also frequently used to raise cars and trucks, and also used in various construction projects. These devices use hydraulics to extend a ram that lifts the load. You can read our review of low profile bottle jacks for more info. Sometimes gas cylinders are used for raising or lowering instead, as is used in attic ladders. Aluminum Floor jacks – like the one pictured on the left – are excellent tools for raising all manner of automobiles. Check out our review of the best floor jacks for SUVs to learn more. There are also other specialty jacks for other vehicles, like motorcycles (see our review of best jacks for Harley’s) and ATV’s. After the vehicle is jacked up, it usually needs to be placed on something more secure so work can be performed. This is where jack stands come in handy.